The Departement of Bouches du Rhone - Pop. : 6.147 h.
by the A50 or the N8. 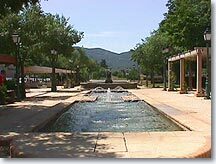 Gémenos is located at the foot of the Sainte Baume mountain and surrounded by wonderful natural landscapes.There are some beautiful walks around the historic village of Gémenos. 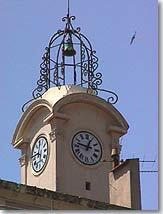 The château, which is currently being restored dates back to the end of the XVII century, and hosts the town hall. Next door you can see the large agricultural buildings which date from 1750, and at one time belonged to the Marquis d'Albertas. 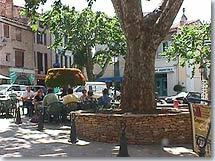 In the center of the village of Gémenos, a number of cafes and restaurants with their shady terraces are a pleasant way to enjoy a typical meal or quench your thirst.and once you have rested you can continue you walk around the not to be missed fountains in the village. 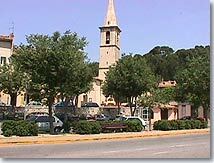 Start at Saint Martin's church, built in the XVII century which watches over the main square. There are some wonderful stain glass windows which tell the story of Saint Martin, the patron saint of the village of Gémenos. Further on at the end of the rue Marius Roubaud, towards the hills you'll will discover the Versailles and Soie fountains which look over the Saitner square. 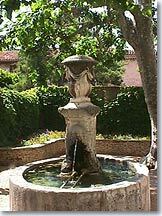 Along the walk the Pigne, Gémeaux fountains and the Granges du Marquis lake, and the Quatre Canons fountain will take you to the end of the tour on the Cours Pasteur, where the Flore fountain and waterfall fed from the Saint Pons well. 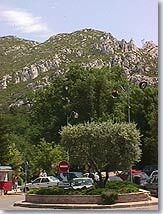 There are numerous hikes in the Sainte Baume. 3 km from Gemenos, Saint-Pons park is a wonderful place to discover Mediterranean Forest species from beeches, hornbeam, tilleuls, holly, green oaks, pine trees, maples... The ruins of an ancient Cistercian convent, the Abbaye de Saint-Pons can also be found in the park. Founded in 1205, the incomplete buildings rise up magnificently from the ground. One way to get to (or for that matter leave) Gémenos is by the steep horseback bends of the Départementale 2 which cuts through the Sainte Baume via Plan d'Aups. Here you will find magnificent view points over the Etoile range of hills, Marseille, Aubagne and the Sainte Baume... this road is truly magnificent, but drive carefully around the bends!! And if you love god food don't miss : In November each year Gémenos organises gastronomic fortnight. Saint Martin's church XVII C. The fountain tour. Parc de Saint-Pons. Abbaye de Saint-Pons. The Farm Grange of the Marquis d'Albertas. Horse Riding. Tennis. Swimming pool. Delta plane. Climbing. Caving. Shooting and golf nearby. 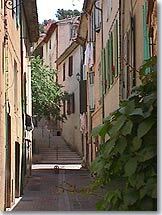 Aubagne (5km), Plan d'Aups ( 15km), Cuges les Pins (10 km), Roquevaire (2 km).